Glenn Irwin, the winner of both superbike races at last year’s International North West 200, will be gunning for a record six victories at this year’s event. 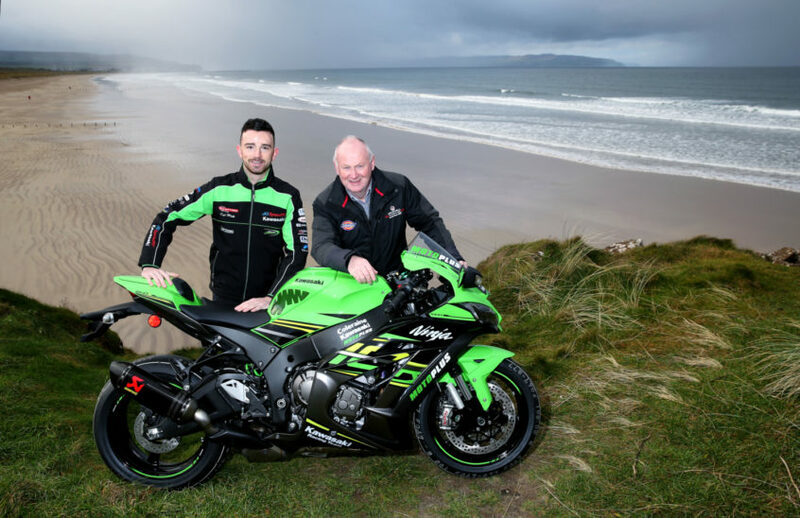 Having made the switch from Ducati to Kawasaki power for the 2018 British Superbike championship, the 28 year old will race a Quattro Plant Wicked Coatings ZX10RR in both of the big bike races at Portrush on May 12-18. Irwin will also break new ground at the 90th anniversary of the North Coast races by competing on a stock version of Quattro Plant’s ZX10RR in both Superstock races alongside riding an ER6 Kawasaki for the CMS/KW Electrical team in two Supertwins events. The winner of the last three NW200 superbike races has never competed in either category on the roads before but with six wins possible from six starts, Irwin says he is aiming high. ‘I am giving myself every chance to win six races at this year’s North West.’ the Carrickfergus man smiles. In 1992 Phillip McCallen won five races in a day on the 8.9 mile Triangle course, losing out on a sixth victory when he slid off at Church Bends whilst leading the 250cc race. Never short on confidence and with his switch to Kawasaki complete, Irwin believes he can outdo that legendary feat. ‘The ZX10RR is a lovely bike to ride and I think it will allow me to bring some aggression back into my riding style and really show what I can do.’ he explains. Peter Extrance’s Kawasaki squad is riding the crest of a confidence wave after winning this year’s Superbike title with Leon Haslam in the saddle. Having previously raced a Supersport spec Kawasaki at the North West 200 and Ulster Grand Prix, the Carrick racer’s decision to opt for the Supertwin class over the 600s might seem surprising but Irwin says it is a carefully considered decision. ‘I haven’t raced a 600 on the roads since 2016 and you have to ride very hard to win a Supersport race, really committing to the corners.’ he explains. Irwin was speaking just a few days before he heads off to Spain to begin a new training regime ahead of the 2019 season. ‘It is all about preparation.’ he explains. ‘When I raced at last year’s North West I had a lot in hand.’ he says. ‘There will be other riders who will be very competitive this year but I will concentrate on me and I will be at the North West dedicated to the cause, chasing that first six-timer.’ he smiles.